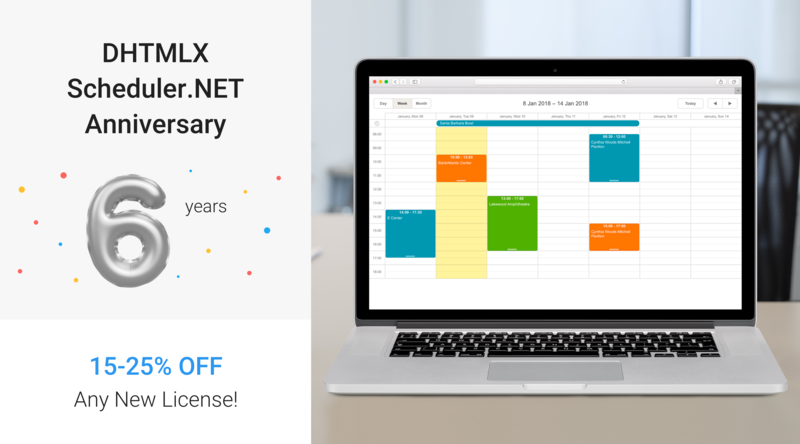 6 years have passed since the very first release of our ASP.NET scheduler. During this period it had been developed enough to meet all the requirements of full-featured and easy configurable calendar. After that we’ll send you a personal coupon code for 20% discount. To get 25% discount, you need to create publications both in twitter and facebook. To get your personal coupon codes for 20% and 25% discounts, drop us an email and contact us via twitter or facebook. The promotion starts today and will be valid till January 31, 2018. Your tweets and facebook posts should stay in your accounts till the end of the promotion. Now you have enough time to give Scheduler.NET a try and realize that it's exactly what you need! ;) If you have any questions about licensing and prices, visit this page or contact our support managers. We are grateful to all of you who are interested in our calendar component and would be happy to see you among our clients! DHTMLX Scheduler .NET product care manager and customer manager.